His Personal History: Born in 1924 in Kunsan City Korea. 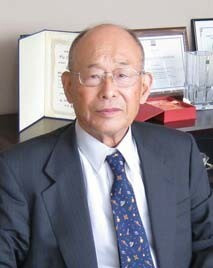 Graduated from Civil Engineering Department, Tokyo Imperial University in 1946. Entered Hazama Corporation in the same year as a civil engineer. Director of R & D section and Technical Research Institute of Hazama Corporation (1976 – 1985). First appearance in ICSMFE in 1977, Tokyo, as a panelist, President of Japanese Society of Soil Mechanics and Foundation Engineering (1984 – 1985), Chair of TC18, Penetrability and Drivability of Piles (1982-1958) and Pile Driving (1986-1989), Chair of TC28, Underground Construction in Soft Ground (1988-1996). 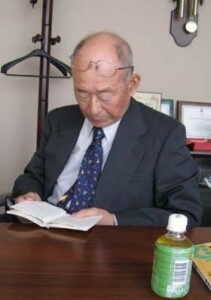 Professor at Tokyo University of Science (1987- 1998). Q: Professor, you are going to be 84 years old pretty soon but you are still working actively participating in some academic societies. May I ask what the key to your staying healthy is, or if you have any special source of energy? A: Well, I don’t think I have been really cautious to live a healthy life. I rather have been living an unhealthy life. Actually I have gotten into dangerous situations many times. Among them, I have suffered from pneumonia twice. The first time was when I was working for Tokyo University of Science and I went to the university with an oxygen tank. When I had pneumonia two years ago for the second time, I was kind of used to it so that I even gave advice to the nurses. Joking aside, I think I owe my longevity to my wife, who is a medical doctor. My wife, who is one year younger than I, had her own medical clinic next door and had been working as an active doctor until last year. I can not thank my wife enough because I have a genuine home doctor. If I can say I have a secret of my green old age, it’s because I remain interested in various things and keep on studying. Q: You have a 41-year-long career as an engineer in a private sector and a more than 20-year-long career as an educator and researcher in academia. In the meantime, you actively worked on academic society activities and international activities. In the first half of this interview, I would like you to talk about your engineer days, when you started your career, and in the second half, I would like you to talk about your experiences as an educator and President of the Society and about your international activities. To begin with, would you please talk about your engineer days in a private sector when you were young? A: Although I worked for a construction company, I belonged to the Design and R&D Department and I had never been in charge of actual construction at the site. Only when a problem arose at the construction site, I went there and coped with the problem. That was my main job. In the company I was working for at that time, it was said that promotion could not be expected unless you worked at a dam construction site, but I did not care about that kind of thing. However, it was said that some hundred thousand yen could be saved if I went to the site. Q: Could you tell me about the occasion which you can not forget possibly among them? A: What I remember very well is, when I was working on digging a research tunnel at the site of Hatogaya dam construction in 1954, that I bumped into a weak layer, which was white and crumbled just like wheat, and did not include water. When I encountered this, I even thought I had to be resigned to die, for it might have collapsed anytime. I had no knowledge or experience about that kind of weak layer, so I seriously wondered as to how to address it, but, after studying various kinds of literature, I finally found a report as to dealing with weak layers of Shasta Dam in America, and, with that as a reference, by means of broadening the width of the dam, I succeeded in solving the problem. Another time, I was in charge of design work for militarization of Haneda Airfield, and in the course of discussion with the person in charge in the US Army, I learned the importance of consultant business in the USA. Especially, in quotation of design business, once or twice I inflated the amount largely because I heard, if the quotation was too low, the work itself might be underappreciated. Eventually the final amount exceeded the quotation by design change and that kind of thing. In the business with the US Army, when I constructed the Yamoto Airfield in Sendai, although there was a design condition with an instruction that “the material which might cause alkali aggregate reaction should not be used”, I had no idea about that then, but I somehow studied and coped with it. Q: Regarding your involvement in the Geotechnical Society, starting from the President from 1984 to 1985 while you were a director of Hazama Corporation, you contributed to the Japan Society of Soil Mechanics and Foundation Engineering serving as the Director of the General Affairs Department and Vice President successively. Are there any unforgettable incidents? A: My contribution to the Society of Soil Mechanics which I am proud of is that I introduced the concept of business management to the activities of the society and I actually gained considerable amount of income. For example, in those days, when it came to estimating the publication cost, since miscellaneous expenses were not taken into account and book costs were so low, naturally it could not serve as a source of income. Q: Do you have any special memories about the international conference which was held in Tokyo in 1977? A: In the Tokyo Conference in 1977, the late Prof. Nakase managed the conference and I was in charge of all the miscellaneous business. Among them what was the most memorable thing was the wine that was served in the banquet. When I asked a friend of mine, Dr. Tadashi Hiroyasu (currently Professor Emeritus of Chiba ‘University, Faculty of Horticulture) about wine, he recommended Yamanashi wine. For the reason that it had been kept and aged in a quiet environment, and that it was advantageous in terms of transportation, I selected Yamanashi wine to be served at the party, which received a very good reputation. I remember very well that the participants checked the bottle and they were surprised to find out that it was made in Japan. Q: You are kind of a pioneer of ground anchors in Japan. Do you have any special memories? A: At the time of the Tokyo Conference, I got acquainted with Prof. Littlejohn at the session of ground anchors, and he suggested that I should go to England by all means. So I went to Bolton, England, and I was taught by Prof. William Deppner many things about anchors. In addition, I learned about the application examples of large diameter ground anchors in foreign countries. That led me to an idea of using a ground anchor when I worked on a large scale earth excavation of over 300m in length and 100m in width in front of Nagoya Station, because the strut would shrink and cause a large deformation of the wall, and eventually I could complete the construction successfully. The president of Hazama Corporation at that time who saw it decided to establish a company specialized in anchors and I assumed the office of president of the company. I have been involved in ground anchor business longest through my career and I am still serving as an advisor for the Japan Anchor Association. Q: You have worked as chairs for the two TCs in the International Society until now. Would you tell me something about it? A: My special involvement in the Technical Committee in the International Society was in the fields of pile foundation and tunnel. As for pile foundation, I worked as Chair of TC on Penetrability and Drivability of Piles, which was established at the proposal of the Japanese society. I had Dr. Hideaki Kishida, Tokyo Institute of Technology, work as Secretary, and we held a symposium on the day before the 11th International Conference (San Francisco Conference) in 1985. In those days Stress Wave Theory began to spread and I remember very well that we had active opinion exchanges with Prof. Gobel and other participants. I published the detailed record of opinions in this symposium. Inheriting the result, I assumed the Chair for Pile Driving (TC18), having Dr. Kishida again as Secretary. At the same time, I launched a domestic committee in the Geotechnical Society and proceeded with study of Stress Wave Theory with young people. Now those young people have grown up wonderfully. 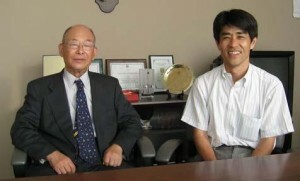 Prof. Matsumoto, Kanazawa University, is one of them. In the 12th International Conference in 1989 (Rio Conference) held under the leadership of then President Broms, as TCs took charge of managing discussion sessions, TC18 was in charge of Discussion session 14 on Drivability of piles. I asked Prof. Randolph and Prof. Kusakabe to be discussion leaders for it, and we had reports about the current status survey on pile driving and bearing capacity, then had a panel discussion about the research issue on pile driving. I also published the detailed report of it. In the 1989 Rio Conference, I was requested to give a special lecture on “Underground Construction, Tunnel, Underground Transportation”, so I mainly explained about the Japanese advanced tunnel technology. It led to the establishment of the present TC28 “Underground Construction in Soft Ground” by the new President Morgenstern, and I again assumed the chair. My first work for TC28 was the survey on the tunnel and bracing technology and design in each country and collection of case history, and based on the survey, I held the first symposium on the day before the 13th Conference in New Delhi. The most memorable thing is that I was presented a gift of appreciation from Secretary General Dr. Parry and Chair Prof. Mair at the banquet of TC28 symposium in London, 1996. Since then, TC28 conferences have been held every three years periodically in London, 1996, and Tokyo,1999, in turn, centering around case history. This year we have 6th symposium. I am still working as Honorary Chairman. Q: Moving into academia from a private sector has now become nothing new. However, I think it is still rare in Japan that an engineer like you who is well-versed in all aspects of practical business moves into academia. Would you please tell us your idea about the difference of roles between the private sector and academia, and give us some advice to your junior fellows in both sectors? A: The difference between the private sector and academia is whether they have a sense of business management. There may be a way of thinking that that kind of thing can be learned after starting work, but I think that an important hint should be given in their student days. Not only students but also university teachers should learn business management by all means. Q: When we sum up your career as an engineer, first you solved various problems, studied overseas technologies and introduced them to Japan in order to meet each requirement, and have developed a prominent sense as an engineer. Later, as an engineer, you have made a great contribution to advanced education as well as to international expansion of construction technology of Japan which made a great progress, and also to its further progress. Would you please give us some advice especially to young engineers in Japan and overseas? A: I would like to tell them to respect your seniors including teachers. From a different perspective, you have to work really hard in order to set an example to your juniors when you become a senior or a teacher who can be relied upon. To keep a good relationship between seniors and juniors. This is a private matter, but when my own house had a fire in April this year, one of my juniors rushed to my house to help us. I feel most grateful to him. Q: Last question. What do you like to do as a hobby? A: I have nothing special as a hobby. It may be participating in various meetings and learning new things, I would say. I also visit disaster sites. I went to the earthquake-hit area of the 2007 Niigata Prefecture Chuetsu Offshore Earthquake. ————————————————————————————————————————–Prof. Fujita, the past chairman of two technical committees (TC18 and Tc28) told me about large number of stories referring a notebook which contains his long personal history with detail data ranging more than 60 years. The interview went on for nearly three hours. I was thankful to his enthusiastic attitude and also astonished by his never-ending energy and challenging spirit, power of memory, and vast knowledge based on huge real experiences. The interviewer hopes that the readers enjoy reading Prof. Fujita’s stories and sharing his thoughts. Due to the page limitation, some of interesting stories had to be edited or omitted in this written version. The reviewer has full responsibility for it. Ms. Emiko Serino kindly helped me for translating from Japanese version to English.